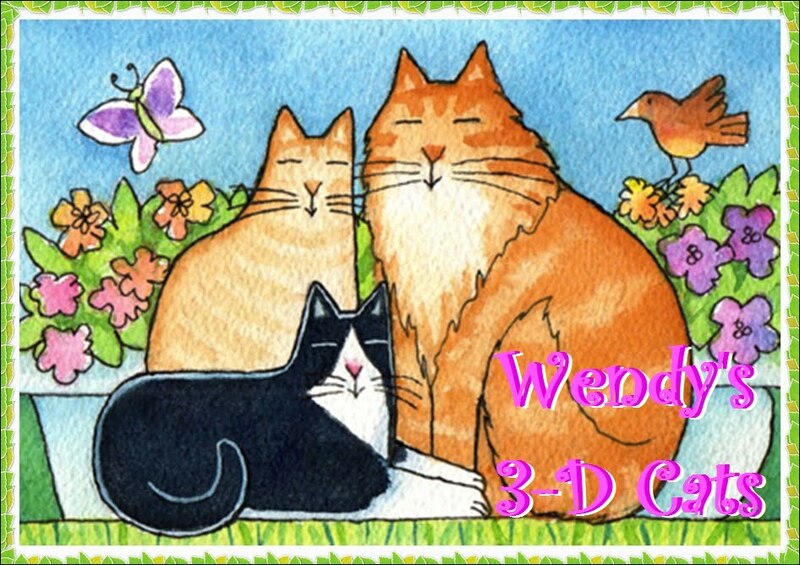 Wendy's 3-D Cats: TUXY TUESDAY WITH DOMINO: THE LION'S SHARE! The weather has finally taken a turn for the better, so the whole family was out on the front porch enjoying the day. Domino was sitting in her purrsonal chair, just checking out what was going on in the general vicinity. "Mai brofur Dylan is unner mai chair", says Domino. "He is a twoll, an' dat's ware twolls belong -- unner fings! I'm wif Charlie Sheen on dis wun." Then Daddy comes along, and Domino wants to snoopervise, but doesn't exactly know what he is doing. And then she looks back in horror! Daddy's putting away the dried branches that were used as winter decor. But worst of all -- DANTE USURPED HER CHAIR! So, Domino tries to reason with him. She doesn't like to resort to violence as a primary course of action. Just then, Mama speaks up and says to Domino "You really must learn to share, my dear!" And then Mama dangles one of the branches at her like she's a fool or something! We won't show you what happened in between (because it isn't pretty), but needless to say, Domino is back on her chair where she belongs. "Mai share is 100 purr cent", says she. And that's the way it's gonna stay! This is the suburbs -- not the jungle, and Tuxy trumps Lion any day of the week! Ha! Of course everyone has to defer to you, Domino--you are Queen and Ruler of the Household! P.S. For some reason, the mom found this so funny: "And then Mama dangles one of the branches at her like she's a fool or something!" Hannah so agrees with you Domino - tuxies have to have a chair of their own. You definitely deserve the chair, Domino! You were there first! Unfortunately Tuxie doesn't trump Tortie in this house. Those Tortie girls are always bossing me around! My name is Kozmo and I am here from tuxedo Tuesday. 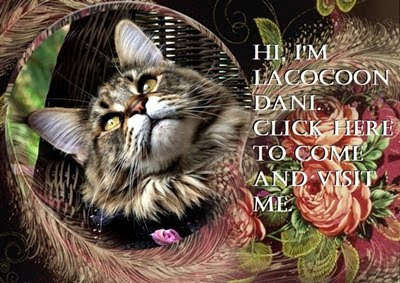 My sister lets me write on her blog 1 day a week. She says thats all the sharing she'll do. Domino, you go girl! Us Tuxedo girls RULE. Heck, all girls rule. Somebody needs to impress upon humans that "sharing" is not part of the Kitty Vernacular. I bet Dommy would share her chair wiv me! What's wrong with ladycats having their own personal chair? I have a whole recliner for myself! Domino- it's beginning to look at lot like springtime there! Remember to suPURRvise- people are so much fun to watch when they are working. Goodness, Domino, you are funny. Are you a winner like Charlie Sheen?? We love that the chair is 100% yours. That is the way it should be. No wonder Dylan was underneath. Take care. Love it! That's your chair, Domino! My mom thinks she uploaded the wrong video last night because she can't even hear the purrs. There was one video where it was obvious! My mom just isn't handling things too well right now. Way to go, Domino! You're my hero!